The Happy Birthday Alphabet candle is individually packed. Each alphabet is a separate candle. So they can be arranged in different ways on the cake. We have been counted amongst the most trusted names in this domain, engaged in providing Birthday Candle. We have carved a niche amongst the most dominant names in this domain, engaged in offering Alphabet Birthday Candle. Candle with the message "Happy Birthday " written on a toothpick base. A block candle with each block having the alphabet of your choice. 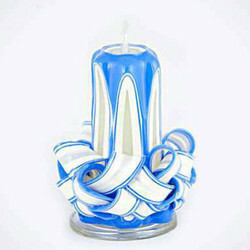 Make your name, message and gift this personalize candle to your loved one.. Min 4 -10 letters burning time 5-7 hours.